Arctic News: Is climate change already dangerous? 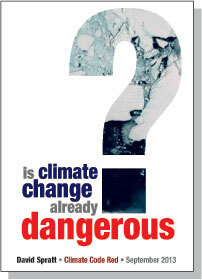 In a compelling survey, this report answers the question many are afraid to ask: is climate change already dangerous? This science survey measures the current manifestations and impacts of climate change against the "safe boundaries" metric; surveys the literature on tipping points and non-linear climate events; and provides a detail study of significant recent events in the Arctic. Is climate change dangerous for just the current increase in global temperature? Is climate change dangerous for the further increases in temperature already implied by the current level of greenhouse gases? By looking at events in climate history where greenhouse gas levels were similar to today, can further light be shone on the "already dangerous" question? The answers are both shocking, and necessary, if climate policy-making is to escape the delusional paradigm within which it is stuck. In a concluding section, this report argues that with clear evidence that climate change is already dangerous, we are in an emergency and face "…an unavoidably radical future". And we know from past experience that societies, once in emergency mode, are capable of facing up to and solving seemingly impossible problems. Hi Mike. I advocate an effective and comprehensive Climate Plan, such as described at the ClimatePlan blog.